The Materia Numerica code is entirely written in C & OpenGL without any third party either commercial or public software. This independant research about self-organized matter , geometry & art continues and the site is regularly updated. Follow us on Facebook! You are welcome to use non-commercially the material of this site but please mention the source materianumerica.net. These pictures are not a deliberate attempt to mimic the physical reality by rendering a kind of scenery. On the contrary, it's an exploration of highly complex objects, where Chaos and bifurcations are always present, and that have their own existence in their multiverse. The spirit guiding here these digital experiments is the one of an ancient geometry, quasi-Platonician, contemplative, applied to the complex beauty of these strange attractors . Photography is a limitless source of mytho-poetical inspiration for connecting with our natural environment and in the same time it provides many insights about the shapes, the shades and the organization found in Nature. Unlike Generative Art, the resolution of the digital photograph has less importance since I perceive photography like an intuitive and a mytho-poetic expression. When the geometry and the illumination are major elements, I prefer pictures in black and white or with only one dominant hue. Most of the pictures presented here were taken in Sweden and the Atlantic coast of France between 2003 and 2010. I started with a Minolta Dimage 7 and from 2009 a Nikon D3000 was used. Except for collages, no or very little post-production effects (gamma correction, balance). The richness of the natural geometry can lead to curious symmetries. 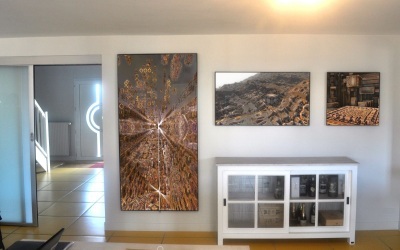 The images shown beside are made with photographic natural matter (mostly vegetal and ice) and simple logical transforms based on symmetry and colour balance. The symmetry is only apparent and the pictures have kept the quasi-fractality of the natural world. But there is something else. A waterdrop contains everything, a perfect geometry, reflective and refractive, where Life unfolds. Original (1600x1200) taken in the garden, Häckeberga (Sweden) in 2009 on July, 1st at 5:01pm with a Minolta Dimage 7. Wasn't it in a Garden, everything began, far away in the Hesperides where a colourful apple gave both Wisdom and Immortality? When the veil becomes thinner, many shapes of wonder can be observed in the Garden of deLight. In the temple of the Winter Solstice, the obscure light of the reborn Sun unites with the Water of Life to draw ephemeral symbols in the sand and the currents bearing all the Elemental wisdom. The Oceanic shore of The Hesperides is both end and beginning, where dwells the World-Serpent who has initiated the Wise. The colour orginal in high resolution is lost (seemingly). It was taken with the Dimage 7 in Brittany in the Forest of Brocéliande, probably in the Summer 2005. Below is found a reduced colour version. For a long time, the traditional Elements have been a source of photographic inspiration. Browse also among the various colours that cross the Elements. A fifth Element has been added, Art, which, according to the tradition is made of the four previous natural Elements and the human art-work. I ought to add here a sixth category Digital showing som pieces of digital collages created with a computer through the years. 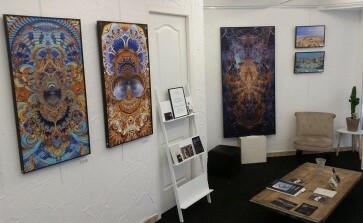 Samples of printed artwork, framed with ophtalmic glass. IMPORTANT: Neither randomness nor graphic desing nor post-production are involved in these images of Chaos. No third party commercial/public software (beside the C/OpenGL programming language) has been used. Ordering an original print from Materia Numerica is also a wonderful way to support an independant research work at the crossing of art, mathematics and a little metaphysics! The public exhibitions in galleries are the natural way to appreciate our prints (see the blog on the front page en page. Nevertheless pictures presented in the front page gallery or in the Facebook page can also be an inspiration source to make a completely original artwork, unique & signed. An authentication certificate is issued with each print. Special art papers for exhibitions, materials like plexiglas and large projects more than 1m are possible, please contact us for any working! For our printing jobs we mainly work with www.impression-panoramique.com. The gallery and art framing atelier Le Comptoir des Arts in Sables d'Olonne will happily provide an original artisan frame of the highest quality. Verified publications and invited communications, most of them with a peer review. After a period of fundamental research in Theoretical Physics (modelling, n-body), a dramatic change of research policies (among others), in a globalized society with upside down values, has lead to an independent exploration at the borders of Mathematics, Philosophy and Art. Despite the ruptures and in a societal context not much suitable to the so-called fundamental research, one may recognize a common thread in these works. The years of resarch in Physics helped to build up a methodology and an robust experience in computer modelling as technology evolved to allow the present exploration of the images of infinity at the metaphysical borders of Chaos and Cosmos. Feel free to browse this site. For any comment or inquiry you may use the form below or write me directly to the e-address. Thank you for your time. The most natural use of the computer? Only mathematical formulas and self-organization (neither graphic design nor randomness) have led to these images of Chaos. The number of user-defined variables is reduced to the minimum to make space for the magic of fractal self-organization. A fractal object computed with an IFS formula. This door was computed using the Chaotic Mandala code (2011). A mask computed by vertical symmetry applied to the fluctuation field. Elemental scenary computed witn the Materia Numerica code (2016).